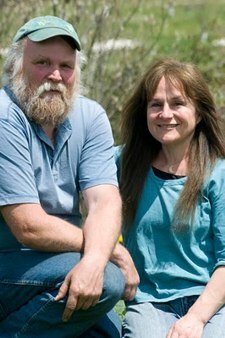 You have reached Nancy and Michael Phillips, the folks who have written The Herbalist's Way, The Holistic Orchard and The Apple Grower. We intend to make this website worthy of your visit, with photos, columns on all things herbal and our favorite apples, ordering information for all our farm products, books, farm classes, and a posting of our speaking schedule. Isn't this good earth a grand place to spend these precious days? And what a blessing now to count you among our friends! Working the land leads to love of place, so true for Nancy and Michael on their family homestead in the White Mountains of New Hampshire. Follow your heart to wholeness through Holistic Health Coaching with Nancy. Please check what healing herbs will be available come summer harvest time. A selection of quality tinctures, compound formulations, and family favorites can always be found in Nancy's Apothecary. Fall means it's time to harvest Lost Nation apples for local sale. Michael Phillips shares green man ways to grow healthy through biological alchemy in his latest book, Mycorrhizal Planet. Learning about symbiotic fungi and healthy plant metabolism will make you a better earth steward. Embrace the "Nondisturbance Principle" and learn regenerative practices for the farm, garden, orchard, forest, and landscape. We all need to catch this mycelial wave and work towards a tomorrow for generations to come. Michael's books, The Apple Grower and The Holistic Orchard, are a good gauge of what to expect next! Calling all Orchardists! Explore the Latest Insights in Holistic Apple Growing here. Lost Nation Orchard is looking for "cider press shareholders" to make a modest investment in local agriculture. Essentially we're forming a privatized Organic Cider Club for those who wish to drink real (unpasteurized) cider. What are the odds of finding that kind of support in the North Country? Now is the time to let Michael know. Heartsong Farm Healing Herbs has made a commitment to monitor local populations of endangered medicinal plants and to cultivate such plants in our field and woodland gardens. You will not find endangered or threatened plant species in any of our herbal offerings unless these have been organically grown from seed or root stock. We encourage everyone to get involved further with the vital work of United Plant Savers to both honor and conserve our green friends. and unsubscribing is as easy as simply asking. The miracle is not to walk on the water. The miracle is to walk on the green earth in the present moment.